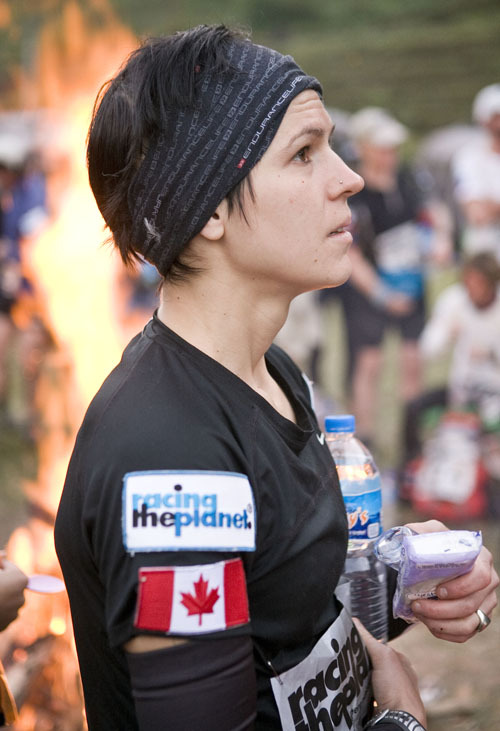 As many of you know, last month I ran RacingThePlanet’s 250 km self-supported footrace in Nepal…And (surprisingly) WON! It was a very tough race, with an incredible women’s fleet (including second place woman Samantha Gash), but I ultimately came out alive. I know I’ve been quite absent on the blog lately (blame New York – it has swallowed me whole! 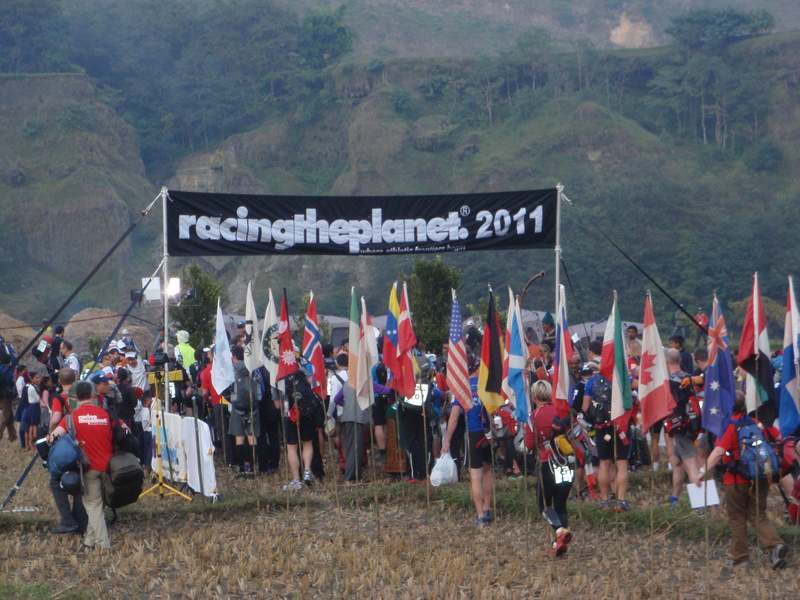 ), so I’m reposting the blogs I wrote during the race, which originally appeared on the RacingThePlanet website. I promise to follow up with more shortly… lots more to come in the New Year. Happy trails – bring on 2012! But as soon as that start happens, with some yelps and whoops of excitement and nervousness, and I feel better. This is what I came for. I try to tune out everyone else in the sense that I don’t worry whether someone is in front or behind, if I’m last or first. I just concentrate on moving forward at the pace my body allows and I know it will all work out just fine. My legs and I have spent months working together for this day, and after that first race start it is like I’m reintroducing myself to them. Hey legs, are you up for this?? The first 4 km were relatively flat (Nepalese flat, as we were told), and then it was straight uphill. And up. And up. I was cursing my training around NYC, which lacked hills to say the least. My heart rate soared through the roof – somewhere hovering over the himalayas perhaps – and I watched the sweat drop off my forehead and onto the stones underneath me. I didn’t seem to be the only one struggling. At one point, one poor guy behind me started throwing up. I don’t know if it was from the exertion or from the bug that seems to be going around (more on that later), but he was in bad shape. After what seemed like forever, I finally crested the top and started the long descent. The course very much reminds me of Vietnam, although without the mud (at the moment). We are running through lots of remote villages and each time we pass a group of small children, we are greeted with high-pitched choruses of ‘namaste!’ The adults have also gotten into the trailside cheering, offering a namaste or two with hands pressed together in prayer-like mode, or occasionally clapping. A few kids yelled out my race number in English and a group of Japanese hikers got very excited when they saw my Canadian flag. Honestly, it was better than the crowds at any marathon. I made one wrong turn – unfortunately uphill – but luckily I couldn’t have lost more than 10 minutes. Others weren’t so fortunate. I would not have gotten first today if Sam Gash hadn’t lost her way, but I have no doubt she’ll shoot ahead tomorrow. 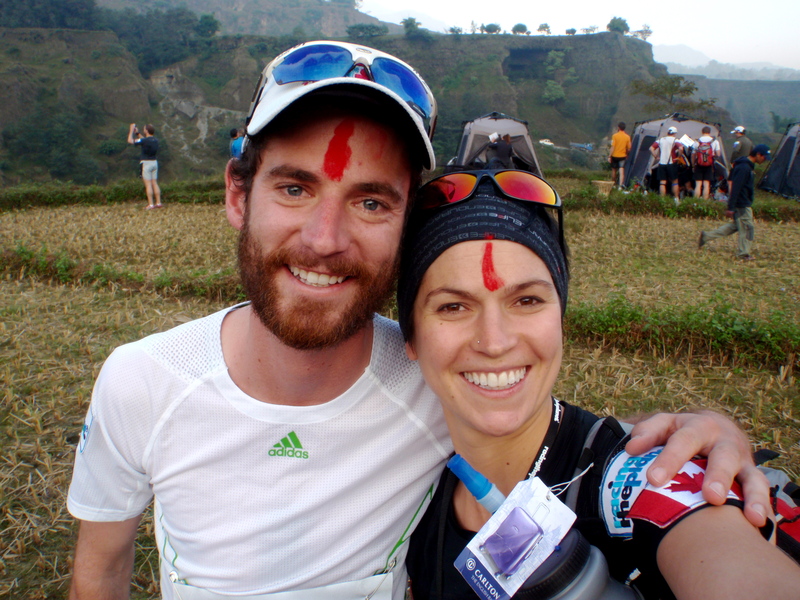 She’s been hanging out here in Nepal for a while already and even done stage 4 already. The alititude and the hills seemed to be a breeze! I, on the other hand, was using max effort today and don’t think I can do any better tomorrow than I managed today. It is a great pleasure running with such a strong women’s fleet. It’ll be a touch race, no doubt. After the race today I headed down with a few other runners to a wonderfully cold river beside campsite. That freezing cold water will do great things for recovery for the legs. Tonight, we are expecting another cold and wet night inside the tent. There are 7 of us, but it is a very tight squeeze. Smallest tents of any of the races I’ve done. We learned last night that we cannot close the door or the vents, despite wanting to keep out the cold air. We woke up this morning to the sound of rain… inside the tent. Without any ventilation, all of the condensation and body heat produced an indoor rainshower and soaked all of our sleeping bags! I didn’t bring a sleeping mat to save the weight, but I’ve found cardboard boxes by the campfire today to place under my sleeping bag for tonight. SCORE! Wish me luck for tomorrow. Thanks to the blog readers who have sent messages – very sweet!! Would love to hear from anyone and everyone… family, friends, and blog readers. Love and miss you all. Tomorrow will be tough. Trick will be not to get sick. Apparently lots of drop outs already from vomiting. Yikes. One of my tentmates was throwing up today on the course. Fingers crossed he’ll be okay. Today was wildly successful… simply because I finished. Still without an appetite, I knew I needed to get some calories in so I dipped into my extra snack bag (saved only for those low moments) and pulled out a saran-wrapped ball of peanut butter and some chocolate. Surely that would make me feel better. I tried to lie down in the tent to get some sleep, and then started to feel very cold… Looking around at the other competitors in their shorts and tshirts, I realized something was wrong. I was inside my down sleeping bag with long pants and a jacket on, and just starting to feel warm. Then, at about 7pm, the vomiting started. I panicked. Vomiting and diarrhea were not part of my race plan. I felt simply awful. Not only physically, but mentally. The nausea, the cramping, the bloating… and knowing that I would have to get up in the morning and run 32 km with serious elevation…. well, it wasn’t good. All I wanted to do was curl up in a comfy bed, watch movies and eat lipton’s chicken noodle soup while my mom patted my head. Instead, I was facing sleeping in a cramped, cold and wet tent and forced to puke in a hole in the ground filled with other runners’, well, you get the picture. I was in good company though. About a quarter of all runners had visited the medical tent with this bug. In fact, it got so bad that the sherpas had to build three or four new toilets in the night. I made it through the night, but not without a few midnight trips to the ‘toilets’. I wasn’t getting better. In the morning, despite not having had dinner or any food in me since about noon the previous day, I wasn’t hungry in the slightest. I knew that I would have to eat SOMETHING if I was going to make it through the day. I managed a few bites of oatmeal, but when my stomach immediately started cramping I knew I’d hit my limit. What made matters worse was that as yesterday’s leader, I was forced to wear a special bright yellow jersey. I just wanted to hand it over to one of the other girls right then and there! All I had to do was get through the day. The doctors said it was a 24 hour bug, so if I could just put one foot in front of the other and finish, I would be happy. I don’t know how it happened, but I finished today on virtually no fuel. I couldn’t eat during the run and I had nothing in the tank from yesterday… But somehow it happened. Somehow my body pulled through and I did it. I can’t tell you how relieved and how ecstatic I am now to be sitting at camp. The elevation was insane (100m of elevation is the equivalent of 1km on the flat in terms of perceived exertion), so even though the horizontal distance was only 32 km, it felt like much, much more. I could barely look up without getting nauseous, and I was pretty wobbly from the lack of calories. At one point I fell pretty hard – full face plant – and showed up at the next checkpoint with blood running down my knee and mud all over my face. I must admit, I did have a pity party or two, but a few things lifted my spirits today. One was the kids. No matter how horrible I must have looked, they all greeted me with such beautiful, innocent smiles that I couldn’t help but smile back. Namaste! Namaste! Eventually my namastes sounded more like ‘namememe…’ but they got the picture. A couple kids got so excited seeing me run by that they followed me fr probably twenty minutes in their school uniforms. Completely unabandoned and eager to push the ground under their feet as fast as possible. It was amazing. The second thing that really helped was the other runners. The other top girls, especially Catriona (sp?) and Sissel, knew I was having a rough day and they gave me such positive encouragement on the hills as they passed by (Sam was already too far ahead!). One of the other male runners said at one point that he hoped his daughters would grow up to be like me. Seriously – if I wasn’t so dehydrated, I would have cried! That’s why I love this race series. You can’t find people like this just anywhere. I finished in third today, which is a small miracle, all things considered. Sure, I came into this race wanting to do well… but you know what? I was so humbled by today, that I would be just as content feeling tired, but healthy. We come here for a physical challenge, for a mental challenge, for a chance to be brought back down to earth from our crazy everyday lives. Whether that challenge comes in the form of competing for first, or whether it comes competing against the bug in your stomach, it achieves the same goal. I am grateful – so so so grateful – for finishing today and I hope to be able to raise my head tomorrow and enjoy the view. That is the only thing I hope to accomplish. Anything else will be a bonus. Tomorrow is straight uphill, with a steep climb at the end. Downhill seems to be my forte so it won’t be my day race-wise, but again, if I can get through without a major stomach upset it will be a victory! One guy broke his finger pretty badly today – he could see the ligament, ew – so I will be extra careful tomorrow on those rocks… Amazingly strong guy. He is, of course, continuing. My friend Eric, who also happens to be camp manager here, says ‘run with your heart, not with your feet’. I think that is how I got through the day. My heart is stronger than any other part of my body, and today I gave it a workout. I would love to get messages from you, so please do write if you have even 5 minutes of time. It helps pull me through. Love to all and happy trails. It is hard to accept being taken down by something you can’t even see. Maybe it would be easier to accept defeat if I was attacked by a snow leopard, rather than an invisible microbe… But I’m starting to see the light. I’m not sure my blog was posted for stage 2 (hopefully soon! ), but I got attacked by the bug that is going around camp. It has hit five out of seven of us now… I am improving though, thank goodness. I’ve gotten rid of the V, and now just working through the D. I managed down about 200 calories of dinner last night and 200 calories of breakfast this morning, but all things considered that wasn’t a lot of fuel for 38 km of uphill today. The ‘D’ has also made me quite dehydrated, which has complicated things. But mentally, I felt like a million bucks today (whereas yesterday, I felt like about 50 rupees!). Just knowing that I was on the mend helped bring me out of my dark place and I wasn’t fearing the day nearly as much as I was yesterday. We crossed a couple of cable bridges today, which were stunning, but not for the faint of heart! We were not allowed to run on them, so I employed my best speed walk possible while ensuring that I never looked down. A surefire way to lose my 200 calorie breakfast on a fragile stomach! It was a long gradual uphill today for about 33 km, all on jeep track. We were following a fast-flowing river for most of the way and running through villages. Lots of encouragement from the locals. Throughout this race, I have been told by a number of young kids “you are number two boy!” which has been rather amusing. The race was advertised on the radio, so a number of villages were prepared. Yesterday, one of the villages even prepared a banner for us saying “welcome to all participant!” (sic) The police were out today as well, helping to point us in the right direction. It really feels like everyone came out today to push us along… and that helped. I felt weak today from the lack of calories, but my head was in the right place. Today I had FUN, and that was my goal. Sam is super strong and so far the only one in the top three females that hasn’t been caught by the dreaded bug. Poor Katrina was vomiting through the night and has had a very, very tough day tonight. If Sam can avoid the bug, she’ll win this race hands down. As for me, I’ll be ecstatic if I can keep my head up to enjoy the view and keep my legs moving. Placing at this point isn’t a priority, and that feels good. I am worried about my friends, who are still sick (Mark has been throwing up for 2.5 days now), but hopefully we’ll all help each other through. Tomorrow is another 10 km uphill, followed by a huge downhill – 3000 or 3500 steps? The muscles are getting sorer and sorer, but I am thankfully still blister-free, despite having accidentally only brought 3 socks instead of a full two pairs (oops). I’m going to try to face a full dinner tonight, which should give me some more energy for tomorrow. Love to all. Keep me in your thoughts tomorrow as you will be in mine! Today, I felt like ME again. It was brilliant. With a full dinner and breakfast in my belly, I felt like I had a brand new pair of legs. I had so much fun today, it wouldn’t have mattered what place I came in… but as it turns out, my place wasn’t too shabby! The day started with 10 km straight uphill – mostly stairs. It sounded worse than it was though, truly. I guess it is all relative out here. These past three days of running with the bug or lack of calories, I really forgot what ‘normal’ was. Today I was BACK. I finally felt like I was in a race I had actually trained for, rather than parachuted into a race I didn’t know what happening until the last minute. I took the stairs steadily, and when I passed the checkpoint at the top I took the brakes off and flew downhill. It was just the best feeling… Flying downhill I barely felt the pack on my back or the pain in my legs. YES! I finally realized I was running in Nepal. How lucky am I. Another runner from the Australia race, Richard Sell, and I ran pretty much the whole stage together. We kept each other at a pretty good pace downhill (for a whole 18 km of steps!!! ), and it was great to have the company. He twisted his ankle at one point and I had a pretty bad fall (giant purple bruise on my quad/IT band), so I think we both appreciated having company just to make sure all was alright. The course wasn’t marked very well on this stage simply because it was a popular trekking route, but it was hard to go off course. It was just mentally challenging because if you haven’t seen one of those little pink flags in about 1000 steps, your brain starts to play tricks on you and you think, well, maybe I did miss a turn? Everything seemed to go well though – minus the fall, eep – and I felt like I flew into camp with a giant smile on my face. What makes things even better is that we are all staying in teahouses tonight! Some are more, er, luxurious than others… Tent 7 has been placed in one of the more modest teahouses I would say, but it is a bed and it will be brilliant. We were even treated to a meal. It was a tough decision whether to partake or not, given the bout of sickness, but safety in numbers? (That theory didn’t work the first time when we all sat down to a pre-race buffet, but oh well). I just chowed down about 15000 calories of dalbhat and french fries, with a side of coca cola. It was amazing. My spirits are high and I’m really looking forward to the run tomorrow. I gained a bit of time on Sam today, but I’m not really thinking about competing tomorrow. It is much more fun to think about running. And hopefully, if all has gone according to plan, my ipods will have a full battery and I’ll have some tunes to run to for the first time! IT’ll be nice to tune out the sound of my breathing! Sam will do really well and I hope to come in some point behind… I hope not to disappoint anyone. And mom, I hope you are feeling better from your surgery. I was thinking about you all day and I love you very much. I’ll keep you in my heart tomorrow. Yesterday was my day. I loved every minute of it. Okay, maybe not EVERY minute, but man, was that ever a great stage!! I knew when I woke up yesterday that it was going to be a good day. My belly was full of calories, I had gotten a great night’s sleep, and my spirits were soaring somewhere above the Annapurna circuit. Really, we were spoiled with relative luxury being able to stay in teahouses, so it wasn’t the prep to the long day that I’m normally used to. I was so excited to be feeling healthy and really looking forward to the views, the challenge, even the pain. These races are all about the long day. It takes a certain kind of dedication and strength to make it through marathon-distance or so runs day after day… But there is something special about the ultra distance I think. I don’t know what it is, but the longer, the better works best for me. I can keep up sometimes on the shorter stages, but it is on the long day that I really feel like I come into my own. I have one speed, whether it be over a 10k, a half marathon, a marathon, or an ultra. So I knew the 72 km would feel good under my legs. We started off with a pretty good climb uphill – more steps – and right from the beginning I broke off with the front pack of guys. I don’t have poles like some of the others, but none of the front guys had poles either so it was down to the quads. One after the other, weaving up the hill back and forth like a reverse skiing exercise, we climbed the zig-zagging stairs. I was drenched in sweat in about 10 minutes and I had to keep reminding myself to take sips of water in between gasps of breath. The other days I had been able to squeak by without being too strict about my water, food, and electrolytes, but on the long day you simply can’t afford to start off dehydrated or hungry. It’ll catch up to you for sure, so I always make sure to load up as much as possible — at least at the beginning. The views were absolutely stunning. Everything you imagine Nepal might be. Snow-capped mountains, pink blossoms on trees, stone villages, multi-coloured prayer flags… I was having so much fun I barely remembered I was competing. To be honest, the first couple of checkpoints flew by. I remember seeing Mary at CP1 and flying straight to CP2. There was a long downhill and a second steep uphill, but the order in between CPs is fuzzy. I managed to stick with Ryan Bennett and Michael (number 2 and 3) for a while, but they would lose me on the downhills. I motored up the hill towards CP5 and caught back up. Any uphill that wasn’t too steep I just went for it. Hey, there’s no reason to hold back on the long day, so just give ‘er, right??? I felt that tingle again. That urge to compete. That urge to push myself. That urge to keep going even when my body is screaming at me to stop. The boys and I ran together for a bit, and we contemplated how far behind ‘the Horse’ was (Stefano… he has the most incredible legs anyone has ever seen – they aren’t quads, they are fives – and so he has picked up various nicknames, including the horse). The Horse and Michael were only 2 minutes apart, so the race was on. We had put some distance between us on the uphill and we thought Michael was safe… until at some point after the next downhill, I started to hear the trotting manimal behind me. My stomach twisted when he easily ran past because I knew what was in store for the two of them. As soon as the Horse caught up to Michael, the two of them shot ahead and I knew they would be battling it out for the next 30 km (which they did – and finished 20 seconds apart…incredible). I kept plodding along and started to slow on the flats, but I knew if I just kept pushing and never stopped to walk then it would be fine. Keep eating. Keep drinking. Keep moving. The kids weren’t quite sure what to do with me. Apparently they harassed a lot of the other runners, but maybe they weren’t quite sure what to make of a female. I cheerily sang out namastes to the groups that I passed and absolutely marveled at my surroundings. I hope this doesn’t sound obnoxious (although I realize it might), but 72 km is the shortest by about 30 km of any of the long days in all of the roving races, so it felt quite short. My legs were ready for more. My brain was ready for more. I could barely believe it when I realized I would be finishing before dark. Before dark!!!! I flew into camp at 5:15 after 10 hours of running with a giant smile on my face. WHAT A DAY!!!!!! I got a bit of sleep through the night after some food, but I was up for large parts as each of the members of my tent came in. Poor Jenna had to drop out after CP3 due to a really painful knee, but her spirits were high and she even got a phone number written on her hand by a Nepalese boy (don’t worry Mark 😉 ). Mark finished strong, as did Phil, and Belinda came in cheerful as ever at 4am. Rob had a painful journey – and it is his birthday today!! – but on the positive side he did see a leopard around dusk! Today I will try to eat, nap, and just enjoy chatting with people. I feel incredibly lucky to have come in 5th place – and 1st female – and I’m so thankful for all of the support I’ve been getting at camp and through the laptop from all of you! Sam had a great run as well and came in about an hour after me last night. She is a strong girl and has been formidable competition. Just a 13km dash to the finish tomorrow, but I don’t imagine I’ll be competing whatsoever. I believe the day starts off with a boat ride across the lake, which should be great, and a finish back in Pokhara. Looking forward to that shower! !